The ageing societies of Asian nations are driving the growth in areas like medtech and other innovative healthcare innovations. The ageing societies of Asian nations such as Japan and China are driving growth in the medical technology (medtech) sector across the region, with medical robotics as one of the key segments being buoyed. In Japan, more than a quarter of the population is more than 65 years old. Other developed major economies in Asia, like South Korea and China, are in earlier stages of a similar trajectory: their populations are ageing significantly. 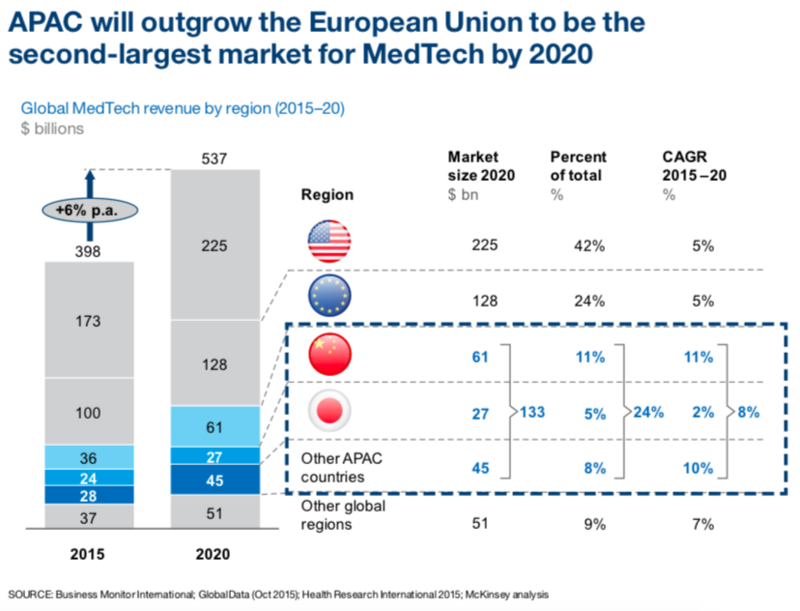 McKinsey research predicts that the Asia Pacific region will beat Europe to become the second largest medtech market after the US, reaching a value of $133b in 2020, up from $88b in 2015. 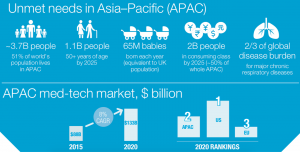 Information from consumer intelligence firm Statista estimates that the Asia-Pacific medical devices market will grow from $68.7b in 2016 to $88.6b in 2020. Energias Market Research predicts that the medical robotics segment of the medtech market – with a global market valued at $6.8b in 2017 – will reach $21.5b in 2024. Ageing populations can significantly alter the economy of a country. Entrepreneurs can take this as an opportunity, argues Janice Chia, founder and managing director of Ageing Asia, a social enterprise and consultancy. In an interview with The Business Times last year Chia pointed out that innovations like medical monitoring devices and assistive technologies like robots will allow seniors to stay independent longer. Growing incomes, higher awareness of health issues, and the growing number of chronic diseases such as diabetes, heart disease and musculoskeletal disorders that come with ageing populations have already led Asian healthcare providers to turn to medical robotics to address a demand that outstrips supply. Japan is at the forefront of this change. Its Ministry of Economy, Trade & Industry (METI) estimates assistive robots will likely play an increasing role in senior care, making up a 400b yen ($3.8b) market by 2035 in the country. Senior care’s emergence as a focal point in Japan and the country has already embraced the use of robots in senior care. Personal robots are starting to fulfil an array of functions in senior care, ranging from robot caregivers that can provide companionship to the simpler task of managing patient medication regimes. Their capacity to operate 24/7 and to automate tasks means they can enhance the quality of life of seniors. They may also enable seniors to perceive less lost autonomy, compared to the dependence on human helpers. Some companies in the space include Fuji Machine Manufacturing and Innophys. Fuji Machine produced Hug, a medical robot that assists care workers in helping patients on to their feet or moving them from bed to wheelchair, while Innophys is developing a wearable exoskeleton suit designed to amplify caregiver’s strength. Meanwhile, China, where 10% of the population is over 65 years old, has announced policies and programmes supporting medtech innovation – articulated in its 13th Five-Year Plan for Development of the Medical Industry. China is also investing in these areas, which has led analysts to suggest these are part of long-term moves to dominate medtech on an international scale. Moreover, China has significant potential for further medical robotics growth, given its status as a major global player in service robotics. Some distinct applications that Chinese medtech robotic players are focused on developing robots for surgery, rehabilitation, and drug delivery. China is the third largest medtech market globally after Japan, though by 2020 China is predicted to displace Japan. While both markets are facing increased demand for senior care, the focus and drivers of Japan’s medtech sector is very different from that of China and influenced by ‘Abenomics’. Tokyo has identified advanced life sciences and medtech as domains whose development could assist the Japanese economy to grow, as well as enable to regain its innovative and competitive edge. With Japanese healthcare enterprises dropping out of top global rankings, medtech is believed to be a sector that could help lead Japan back to a competitive state. China’s medtech sector has more opportunity for growth compared to Japan. But its growth drivers are rooted in healthcare policy reforms, changes to China’s complex healthcare reimbursement policy, and a shift in healthcare provision. 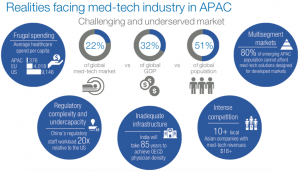 However, a number of factors will inhibit the growth of medtech in the APAC region as a whole. Medtech players have traditionally focused on the region’s premium segment and adopted a cautious approach to developing their business. Unlike other sectors, such as consumer electronics, apparel & footwear or pharmaceuticals, medtech players have not penetrated the region as much as other industries. Areas that will create friction for medtech players expanding their presence in the region include the limited financial resources that consumers in such emerging markets possess, coupled with a more frugal attitude to healthcare spending. On an operational and marketing level, medtech plays will also have to develop ways to efficiently serve multiple customer segments efficiently. Emerging markets also pose the problem of having underdeveloped medical infrastructure and workforces, which can inhibit the deployment and adoption of new technology. McKinsey references the “fragmented and inconsistent set of regulatory and reimbursement regimes”, which can deter the introduction of new technology.